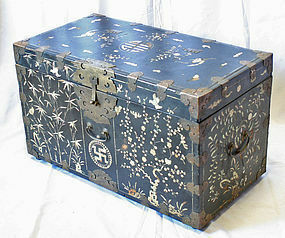 Early 20th Century Large Black-Lacquered Mother-of-Pearl Box, in fair condition with much loss of the mother-of-pearl. The brass hardware is old but is not original. 31.5 x 18.5 x 16.5 inches, 80 x 47 x 42 cm.